Templeton Rye Whiskey was awarded the Gold Medal at the San Francisco Spirits Competition, held March 21-22, 2009 at the Hotel Nikko. The competition was founded in 2000, and is the first comprehensive, international spirits judging ever held in the United States on an annual basis. Want to try this award-winning rye whiskey for yourself? There are plenty of opportunities in the coming days as Chicago celebrates Whiskey Week as the kick-off to WhiskyFest Chicago, held next Wednesday, April 1 at the Hyatt Regency Chicago. When prohibition outlawed the manufacture and sale of alcoholic beverages in 1920, enterprising residents of tiny Templeton, Iowa, population 350, came together to create an American classic known as Templeton Rye Whiskey, or “The Good Stuff” to those in the know. Over the course of its storied history, Templeton Rye became Al Capone’s whiskey of choice, quickly finding its way to the center of his bootlegging empire. Speakeasies in Chicago, New York and as far west as San Francisco, poured Templeton Rye as the "Best Whiskey in the House." Later legends suggest that a few bottles even found their way inside the walls of Alcatraz to the cell of prisoner AZ-85. Available legally for the first time, the infamous small batch rye whiskey returns. Aged in charred new oak barrels and produced from the original Prohibition Era recipe, Templeton Rye provides a smooth finish and a clean getaway. 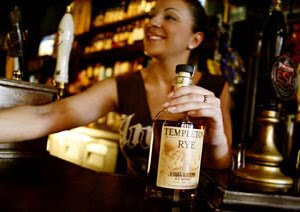 Find out more at www.templetonrye.com. Malt Advocate’s 9th Annual WhiskyFest Chicago 2009 will be at the Hyatt Regency Chicago (151 E. Wacker Dr.), from 6:30 p.m. to 9:30 p.m. April 1. General admission tickets are $95. Business or business casual attire is preferred. yFor more information, please call the hotel at (312) 565-1234 or visit WhiskyFest’s blog at www.whiskyfest.wordpress.com.